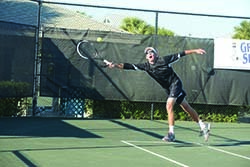 BY JEN FIERS – The 2016 Pro Tennis Exhibition Series starts next Wednesday, Feb. 3 at 4 p.m. at the Boca Grande Club. Matches will continue each Wednesday thereafter until March 16th with donations benefitting the Suncoast Humane Society. Matches will include eight men and eight women competing for over $5,000 in prize money. Four new players, some of the top pros in the region, will be gracing the courts this year. Bob Blaze, Director of Tennis at Twin Isles in Punta Gorda, has been a USPTA and USPTR certified teaching pro for over 30 years. He is also an ATP Alumni having reached world rankings in the top 250. He will be joining Adam Zastempowski from Jacaranda West Country Club, Jackson Moore from The Gasparilla Inn, and past Series champion H Wetzel from Boca Bay Pass Club next Wednesday, Feb. 3 at 4 p.m. for the first Men’s Semifinal match. John Janes is the Head Pro at The Landings in Sarasota for the winter seasons and at Great Harbor Yacht Club in Nantucket during the summers. Janes played the Series several years ago and was a top player at Auburn University with Boca Grande Club’s Head Pro Adrian Moghina. They will team up together again to play in the second Men’s Semifinal match on Wednesday, Feb. 17 at 4 p.m. The other two pros in that match will be past Series champion, Scott Harrington from Shadow Wood Country Club in Bonita Springs and Nate Griffin from River Strand Country Club in Bradenton. Two new players are competing in the women’s side of the series this year. Originally from Virginia, Amanda Rodgers moved to Florida to train at Saddlebrook Tennis Academy in Tampa. She is a recent graduate from Syracuse University where she played #1 singles and doubles and is currently playing the WTA professional circuit while working towards her Master’s in Broadcast Journalism. She is taking time out of her busy tournament and academic schedule to play in the first Women’s Semifinal match Wednesday, Feb. 10 at 4 p.m. The other three players in that match will be former top-100 WTA players Karin Miller from Sarasota Sports Club, Tiffany Davis from River Strand Country Club, and Mary Rompf from Plantation Golf and Country Club in Venice. Our other new player in the women’s series is Tatiana Soldatova, who is currently applying her training in competitive tennis to the competitive real estate industry in Bradenton. Raised in Russia, Soldatova moved to Florida in 2006 to play at Jacksonville University in the #1 singles and doubles spots. Upon earning her Master’s of Education in Sports Management and Leadership, Soldatova took a coaching position at IMG Academies in Bradenton and a mentoring position with the WTA. She will be playing in the second Women’s Semifinal match on Wednesday, Feb. 24 at 4 p.m. with fellow competitors Mara Schmidt, currently playing on the WTA professional tour, Jess Steck, the 2015 Series Champion and former top-50 WTA player, and Jen Fiers, Director of Tennis at the Boca Grande Club. The Pro Tennis Exhibition Series kicked off with the sold out Tennis Ball this past Wednesday, Jan. 27 at the Boca Grande Club. The live auction raised funds to benefit the Suncoast Humane Society as will the $5 donation requested at each exhibition match. In case of rain, the make-up day for each match will be the following Friday. Please email jen@bocagrandeclub.com for more information about the exhibition series.